How to dress for baseball game? Baseball is definitely one of the most interesting outdoor game. It is a lifestyle that is admired; and thousands of people partake into it. Along with that, ball parks have large number of youngsters who come there to hangout with friends, cheer up for their favorite team and much more. Here are some Trendy ideas for a Baseball Game Outfit. A nice floral shirt coordinated with blue jeans and sandals gives a fresh and comfortable look while you are going to a ball park in summers. Skinnies work best for the sports area as you constantly need to cheer so these are a practical ensemble for the game. For winters you can add a long sweater or a half coat with boots for a nice comfy look. Baseball fans know that when you are a game fan dressing in high fashion wont do the trick rather being simple and keeping to the basics is the best formula. This styling idea is a classic baseball style. 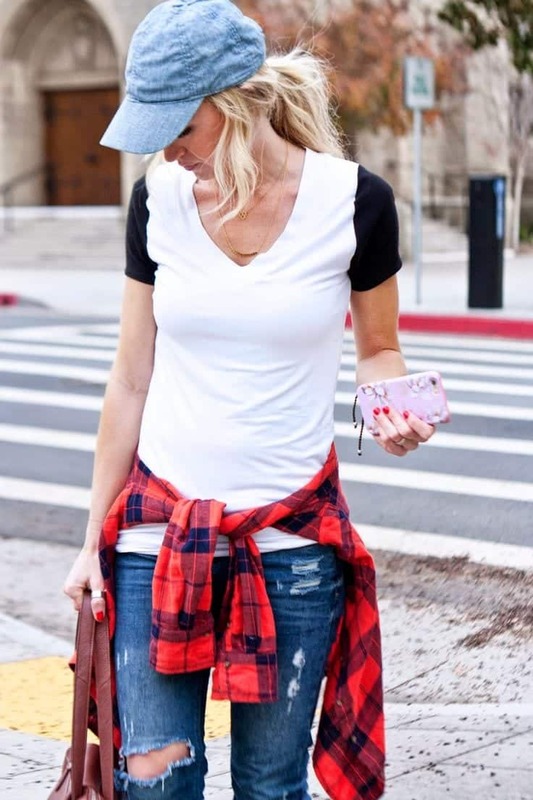 Just wear jeans, ripped jeans to bring in a little fashion, baseball hat and simple plaid t to cover yourself up either from the sun or a little chill. Jordans will go perfectly with the whole outfit. Keep your hair ties up with this style. Rihanna the fashion diva is a fashion blog in herself. Follow her style for attending the games also. She sets it up for everyone. She has kept it basic with the classic combo of black and white. Black colored baseball cap with a white shirt over a spaghetti black vest, black leggings and high heel sneakers; matched up perfectly. Accessorize with lots of rings and chains and a bold lip color. At least I love these soft jackets. They can be worn over a slim tank and skinny jeans with sneakers. If you are a true baseball fan you must be having this jacket in your wardrobe. This cool grey and white combo is perfect for any boy or girl and can be worn easily with jeans, shorts, mini skirt and leggings. Jordans, sneakers, plimsols.. any type of sneaker will go with the dress. Tie up your hair in ponytail. Going to the game during summers? Shorts and a simple t-shirt is what will take the game to the high level. The red and white combo of Keep Calm and Play ball T-shirt with light blue short jeans; red and white sneakers to match up with the shirt is all you need to have your self scrutinized by the opposite gender. Those ball studs will give a cute look to you. Also have a look at these[highlight] Cool Nike sports outfits for women[/highlight]. Coolio! This is perfect for summers. Neutral shades give a cool and calm effect during warm weathers and this beige plain shirt when coordinated with denim shorts and black sandals is absolutely relaxing. Wear a fedora hat for the shade. You can wear a watch and a bracelet. Easy to go with. No matter what the event is; heels always gives you a stunning and a stylish look. That’s what i usually do, wear a collared stripped shirt of my brother, sleeves folded up, jeans and high heels; you’re ready to go! 😀 Add a baseball cap and lots of bracelets and a statement necklace. Light day makeup is required only. Wear skater dress in texture with baseball sleeves. If planning a day filled with games in winters, wear this thick skater dress in grey and black with stockings and ankle high boots or Jordans with a woolen beanie. Keep hair open for this look. Want a sporty look about you? You can be the risk taker by wearing this beautiful maxi net skirt with a red half sleeved and loose baseball tee and wear necklace to add coolness to it. Wear heels for the party after the win and replace your heels in the stadium with a pair of red sneakers. Bangles or bracelets will complete the look. Denim on denim is the best baseball combo. Pair sleeveless jeans collar shirt knotted at the front and a little cropped with same shorts and accessorize it with a wrist watch and a belt. Jazz up the outfit with black and white Jordans. This is really cool.. Baseball high heels can match with any sort of outfit. Whether you are a cheer leader or not mini skater skirts look ultra chic and a red and white baseball shirt with a matching skirt and a red cap and white stockings is nicely fashionable. Sporty body con mini dresses in black and white with players numbers on them look classy. Wear them with Jordans or high heeled sneakers. Loose and large baseball shirt of your favorite team worn with simple black leggings/ tights and a pair of sneakers with hair piled up in a bun. My name is Ejaz Ch. from Zed Pak Industries and I would like to discuss future business opportunities for the both of us. Zed Pak Industries (ISO-9000) was established in 1988 and has since always been committed to producing top of the range Sports Goods that meet all our customers changing demands. We are looking for business partners to expand our brand in your market. Here at Zed Pak Industries we offer an alternative, superbly designed and manufactured BASEBALL SUIT @ USD:15.00 with the strictest quality control management in the business. We believe that our standards guarantee high sales at the high end of your market.